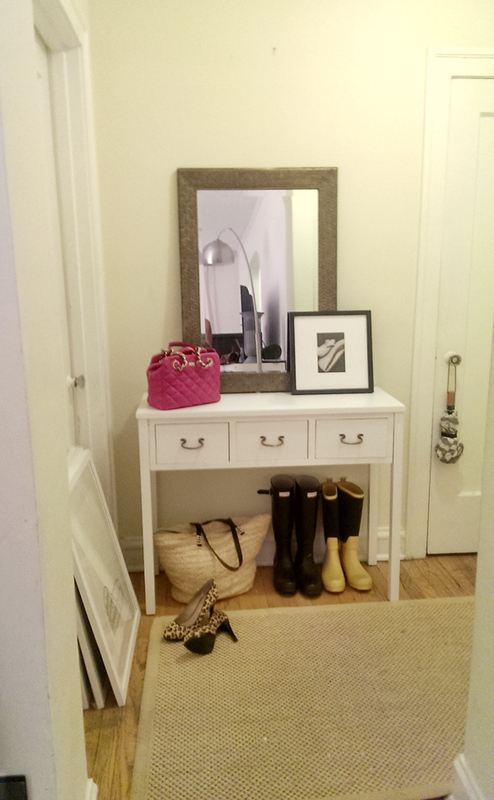 What about shifting that entry table in front of the now immobile door? It might be more impactful straight ahead of you as you walk in the door. 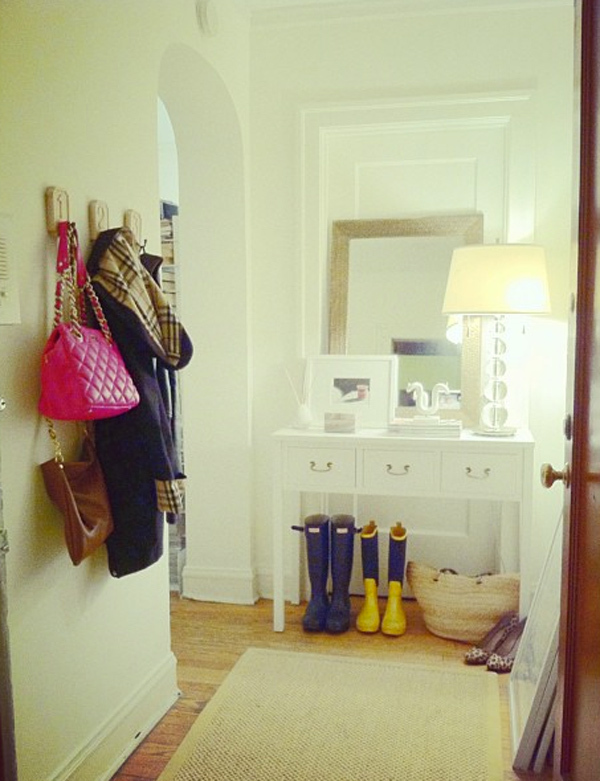 Plus the door itself would add visual interest to whatever mirror you place above the console. There's my two cents! The indoor outdoor rugs by dash and albert are great - I have a tan and white striped one in my mudroom and when it gets dirty, a good shake usually does it. If it's really bad, I've been known to throw it in the washer and it comes out looking like brand new. yay stripes!!!!!! are you going to paint it or buy wall decals? and i think a dark rug may ground the room. so excited to see it! also, are you going to leave the door just white or are you going to do that too? i think it would be cool if you do part of your door the same color as the stripes and then hang art down the middle. I think that I love this!! And that is all... :) Can't wait to see more! I love Overstock! We got our dresser from there, and really like it. 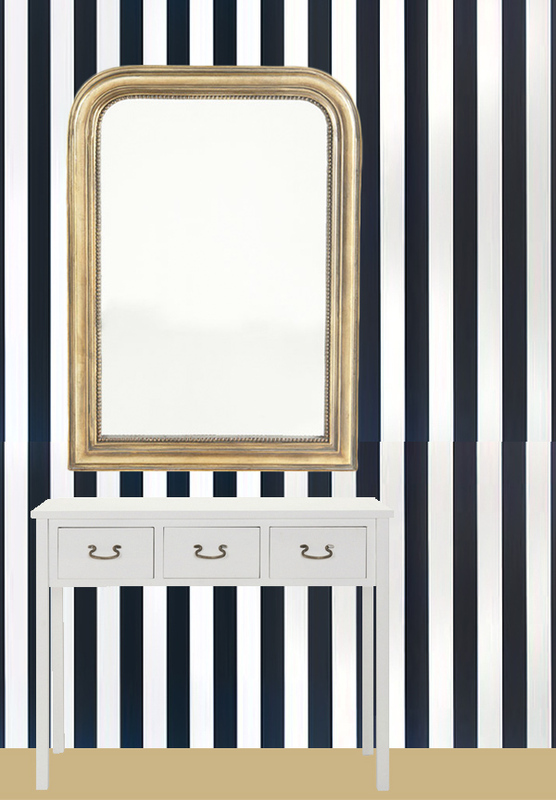 Obsessed with black + white stripes right now, so obviously I'm loving this look. Can't wait to see what you do with the space! 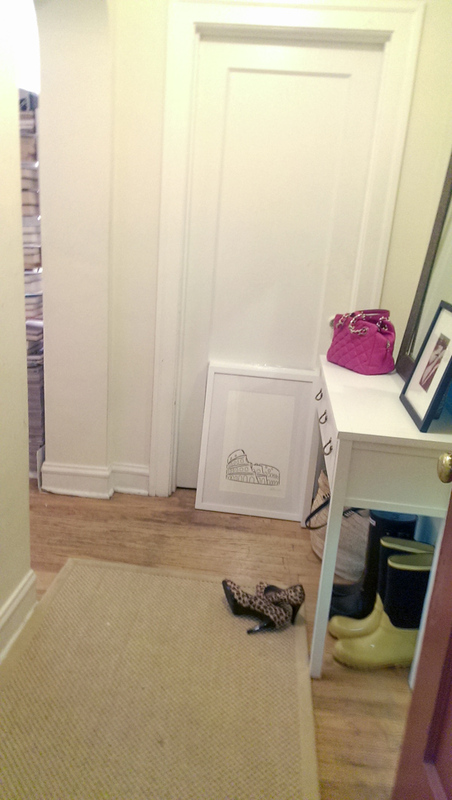 I'm so excited to see how your entryway turns out! I think once you see how the walls turn out, you'll know what to do with the rug. Looks great already! On another note, I hope you do a post about Framed and Matted. I could definitely use some affordable framing (badly) but I found the website super confusing. Thanks! Would you consider a vintage persian or tribal rug? I've had really good luck finding them on ebay and you would only need a small one. I think the contrast between the vintage rug and the modern stripes would be cool. I have some in my house and I also have a chocolate lab - they hide all dog hair and dirt! Good luck, it looks great so far! This is so great! I can't wait to see what it looks like with the stripes. Have you considered an earthier jute rug to contrast all of the great modern details of your lady space? I have a feeling I'm going to like this makeover a whole lot! Can't wait! 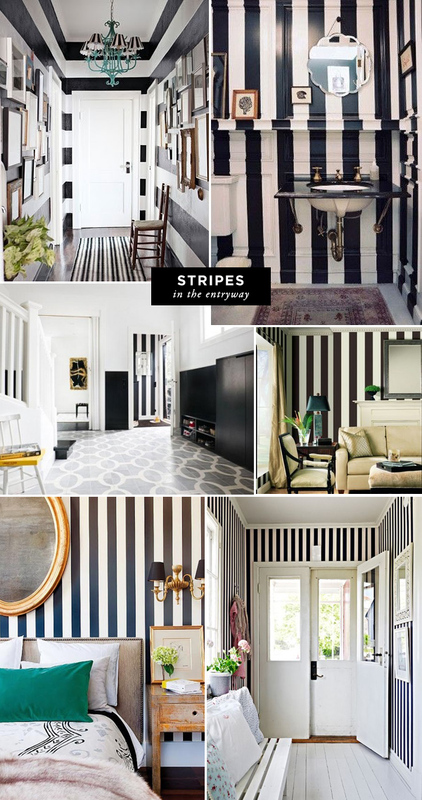 I'm obsessed with the black and white stripes so I can't wait to see what your entryway is going to look like! Would it be a crazy idea to get a pink rug (maybe even have it bound in black)? That might seem too candy store for you (not sure). A pink trinket on the table would tie it together. I also love the Flor tile and the persian rug ideas that were previously mentioned. I love a good striped entry way but I think it might be too much with the striped rug you have right there in your living room! Moving that table worked GENIUS! If you hang the mirror on the door, it may look even more like an architectural element. Anxious to see the stripes.